....there, that should hold you through the weekend. A Nitpick With Publishers... but a Thumbs-Up to Matt Parker! I briefly mentioned Matt Parker's new book (sight unseen), "Things to Make and Do in the Fourth Dimension," in my recommendations for the Holidays, based on reviews I'd seen, but am now reading it myself and can give an even more enthusiastic thumbs-up! It's a joyful read (unless you despise puns, in which case stay far, far away!! ;-)). It's really the only "recreational math" book on my list -- I did recommend Ian Stewart's latest puzzle compendium volume, but puzzle books are a bit different from recreational math which is a broader and rarer category these days. In fact, this is one of the very few books that I think could be mentioned in the same breath with Martin Gardner's recreational writings. While reading it I even found myself contemplating the slight similarities between the names, "Martin Gardner" and "Matt Parker"! Anyway, most of you are likely familiar with stand-up comic/mathematician Parker from various YouTube appearances or elsewhere, and he brings the same lucid, lighthearted, but still instructive style to this book that he exhibits on the internet. 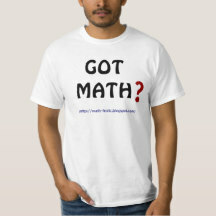 His own infectious delight with math comes through both in the wide-ranging text and even his(?) simple hand-drawn illustrations. 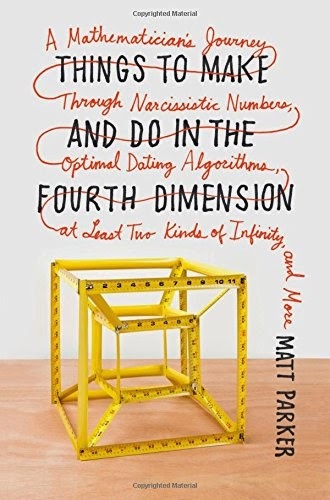 The book's subtitle offers some hint as to just how wide-ranging it is: "A Mathematician's Journey Through Narcissistic Numbers, Optimal Dating Algorithms, at Least Two kinds of Infinity, and More." As the book flap says, it's "a grand tour... both playful and sophisticated." I won't attempt a full review here (not even sure when I'll complete reading it), but simply highly commend it to your attention. BUT... I do have a minor beef with it... or, perhaps more specifically with the publisher. This book is over 400 pages long and an inch-and-a-half thick, with an American retail price of $28.00 (and I wouldn't recommend reading it on an eBook reader, but that's me). A lot of folks who are already a tad phobic, or just naive, about math will be intimidated by the look/feel of this volume, as well as discouraged by the price. That means a lot of people who could benefit from reading it, and who it is partly intended for, won't purchase it... which is a shame... also means lost sales/profits for the publisher. With slightly smaller print, less white space, maybe thinner paper, and perhaps even a softcover, this volume could've been brought in well under 400 pgs. and at a lower price... and, been less imposing to readers. (I don't know if the British edition is any different from the American edition.) Even the title (probably meant to be intriguing) I suspect is a bit imposing, abstract, and maybe overly long to many, and could've been better chosen. Might add, as a side-note, that I've long thought Princeton University Press (not Matt's publisher) is a publisher that generally does a great job with the physical presentation of their popular math books... maybe they've been at it longer, or specialize in it to some degree, but kudos to them for whatever the reason. Well, I need to get back to reading Matt's volume; some reviews say the second half is even better than the first! I didn't believe 2014 could be as banner-a-year for popular math books as 2013 was, and, I don't believe it has been... but, still a dang good year! Back in June, I predicted Jordan Ellenberg's "How Not To Be Wrong" would end up as my favorite book of the year, and that's proven true, though with a bit of semi-stretching (I'll get to later) it has a strong competitor. I've never seen a bad review of Ellenberg's book. If you haven't read it, get it! If you have read it, read it again! Meanwhile, Alex Bellos gave us another fine effort this year with his "The Grapes of Math" (American title)... another fun, enjoyable, instructive read from Alex. The above are the two main new volumes I recommend Xmas wrapping for a general readership of mathy stuff. For the puzzle-lover on your list I don't think you can do much better than Ian Stewart's recent "Professor Stewart's Casebook of Mathematical Mysteries." Stewart's previous puzzle compendiums are just as good though, if you don't need to have his latest volume. Also, worth noting that one of my favorite Stewart books, "Visions of Infinity," is newly-out in paperback (not a 2014 volume, but still worth suggesting). Three more 2014 volumes I don't mind recommending to narrower audiences are: 1) "Mathematics and the Real World" by Zvi Artstein -- a volume I have some qualms about, but ultimately liked the overview it gave of math history 2) "Four Lives: A Celebration of Raymond Smullyan" from Jason Rosenhouse -- a volume suited primarily for Raymond Smullyan fans. I often don't see Rosenhouse's volumes distributed very well -- honestly, I believe he needs a new agent or publisher(! ), because he's one of the best, most consistent math writers out there (and I say that as someone who doesn't always agree with him, but always finds his arguments thoughtful and well-stated -- for this particular volume though, I'll note, he is just editor). Finally, 3) a volume I'll recommend without having finished it yet, is the latest "The Best Writing On Mathematics 2014" ed. by Mircea Pitici -- each edition of this series has been better than the one before, and I think that trend continues in this rendition, which seems full of interesting stuff. I'm always impressed with Pitici's diversity of choices, even though there are always ones whose inclusion I don't quite understand. Anthologies are typically a mixed bag, but hopefully the selections you don't care for will be outweighed by the number and quality of those you do enjoy. One volume to throw in simply because it may be a hit for the holidays is "The Mathematics Devotional" from Clifford Pickover. Personally, I'll wait 'til there's a soft-cover version, if I purchase it at all (may eventually buy it simply as a source for more "Sunday Reflections" over at Math-Frolic). As much as I love Dr. Pickover's earlier popular math output, I've not been a fan of the recent, more 'formulaic' and visually-gaudy series from him -- just my personal preference. 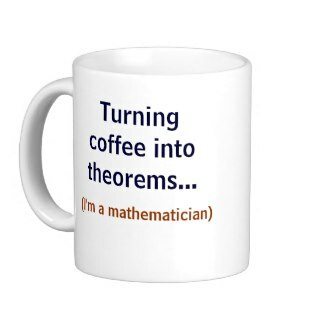 Having said that, anything that gets math/science into the hands of more people I'm all for, and his books have succeeded at that (or at least they're dwelling on a lot of home shelves and coffee tables). So give it a look if it suits your taste, but I can't honestly recommend this pithy, glossy volume for those on limited budgets, who need more bang for the buck. Also, know that a "Physics Devotional" is in the works. Reaching back to 2013. 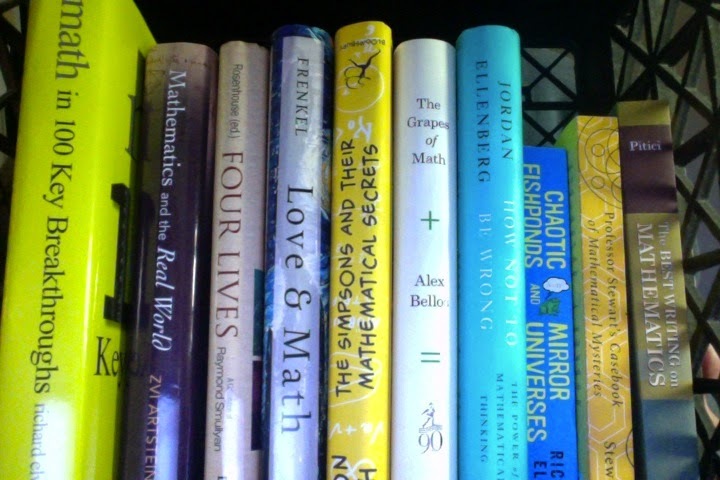 A couple of wonderful books from that year, are now out in paperback: "Love and Math" by ever-inspiring Ed Frenkel, and "The Simpsons and Their Mathematical Secrets" from Simon Singh (one of the most fun math reads ever). Both must-reads for the math-enthused, if there's anyone left who has missed them. Finally, here is my 2014-stretch (alluded to above): Richard Elwes put out two 2013 books that are fantastic (but poorly distributed in the U.S.): "Math In 100 Key Breakthroughs" (a GREAT reference source) and "Chaotic Fishponds and Mirror Universes" an informative, wide-ranging (ill-titled) book that I didn't acquire until 2014, and enjoyed almost as much as the Ellenberg volume -- it's hard for me to even recommend one over the other, but in-the-end, Ellenberg is set apart from all competitors by his witty, fanciful style, so rare (indeed difficult) in a popular math book, so I give him the nod, but do VERY highly recommend Elwes' book. Anyway, these are some of the book stand-outs for a general audience from my view, but there were LOTS of other popular math offerings in 2014. If you had a favorite you wish to make sure readers consider, feel free to mention it in the comments. And let's see what 2015 brings our way (among other things a new biography of Martin Gardner is on the horizon).